You’ve got to admit broccoli and cheese go great together and while many of you may be thinking, my kid would go for a broccoli mac and cheese (recipe below), some of you are no doubt thinking there is no way my kid will eat mac and cheese with something green in it and that’s OK. I suggest you serve the broccoli raw on the side with a dip and make their portion of mac and cheese without the broccoli. Seeing you eat and enjoy new combinations of foods is a baby step towards trying it. For more ideas watch this Broccoli 4 Ways video. Dietitian's Tip: Make this a complete meal. Add in a protein of your choice. Try diced cooked chicken, trout, turkey or even a can of lentils, salmon or tuna. *Kids Cook Teach your child how to use the grater and get them busy grating cheese. If cooking with your kids seems like too much work just give them one task to do. Overtime, they will build skills to become a more competent cook. Simply stir in bite-size pieces of steamed broccoli in at the end of cooking your favourite mac and cheese. 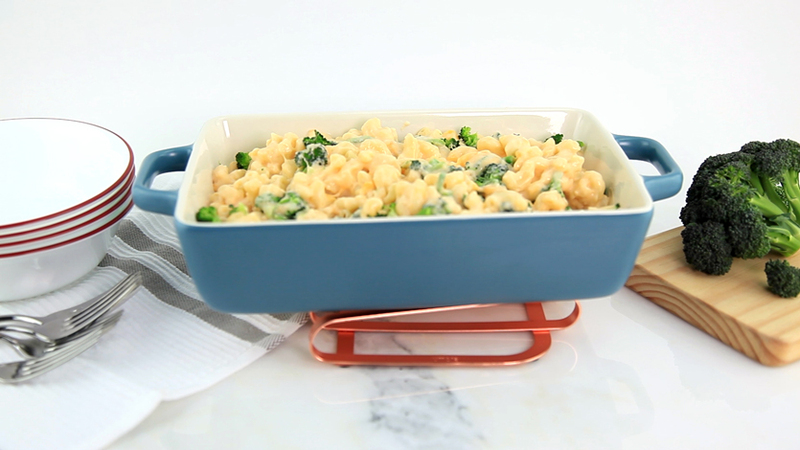 Add about ¼ cup broccoli per serving OR try this –One Pot Broccoli Mac and Cheese. In a medium-size pot, boil salted water and cook 2 cups dry elbow macaroni pasta for 5 minutes. Add 1 head of broccoli (cut into florets, trim, peel and dice stems). Continue to cook for 3 minutes. (2 minutes short of al dente for pasta). Drain in colander and set aside. In the same pot, melt ¼ cup butter over medium heat, whisk in 3 tbsp all purpose flour and 1 tsp dry mustard (or Dijon) until blended, about 2 minutes. Slowly whisk in 3 cups of milk. Bring to boil; reduce and simmer until sauce is slightly thickened (like cream) about 4 minutes. Remove from heat and whisk in 1½- 2 cups of shredded cheddar cheese (depending on how cheesy you like it). Add pasta and broccoli to sauce. Pour mixture into casserole dish. Sprinkle with 1 cup fresh breadcrumbs (see tips below). Bake in 375°F for 20 minutes to crisp up the breadcrumbs. To make breadcrumbs: Take day old bread and break up into clumps. Add clumps to food processor or blender. Add a handful of parsley leaves (optional) and handful of grated Parmesan. Pulse into breadcrumbs, about 3 minutes. Place breadcrumbs into freezer bags and keep in freezer to have on hand. Alternative option for fresh breadcrumbs: In bowl, mix 1 cup panko breadcrumbs, ½ cup grated Parmesan, ¼ cup melted butter. • Hot or cold, mac and cheese makes a satisfying lunch.